How did it go for C-Job in 2017? Check everything you need to know in this infographic about C-Job, the largest independent ship design & engineering company in the Netherlands. C-Job has designed a series of five sustainable car and passenger ferries for the GVB Amsterdam. “The vessels will operate 100% on electricity, thus providing an emission-free urban transport solution,” says Project Manager Pim Schulp. C-Job Naval Architects has opened its first international office located in the Ukrainian city of Nikolayev. Managing Director of this newly formed subsidiary company Andrey Zherebetsky points out how this new office will bring some important benefits to C-Job’s clients. C-Job doesn’t just work on new-build ship design projects; a major part of the business also involves engineering tasks for existing vessels. 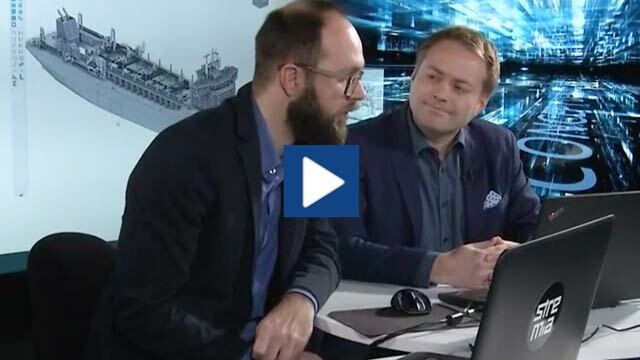 “This type of work is not just about lifespan extension, but also about maximising the efficiency and productivity of the vessel,” says C-Job’s Head of Engineering Tim Vlaar. Earlier this year, Neptune Marine delivered a 200m3 Trailing Suction Hopper Dredger. C-Job contributed to the project, called the EuroHopper 200, with the fast completion of an engineering package and production drawings. The productive cooperation between the two companies meant that Neptune could complete the entire project within a nine month timescale. On the 13th and 14th of December 2017, C-Job Naval Architects and global maritime software house NAPA are organising a webinar to introduce Accelerated Concept Design to the wider public domain. The main aim of the webinar is to present the key applications and advantages of C-Job’s Accelerated Concept Design to the maritime industry. Participation of the webinar is free of charge and open to all. C-Job Naval Architects celebrates its tenth anniversary this year. What started as a small naval architectural office 10 years ago has grown into an established and well-respected company. Using various projects and a growing number of in-house disciplines to demonstrate how the company has developed, Managing Director Basjan Faber looks back at some of the most significant moments of the previous decade.